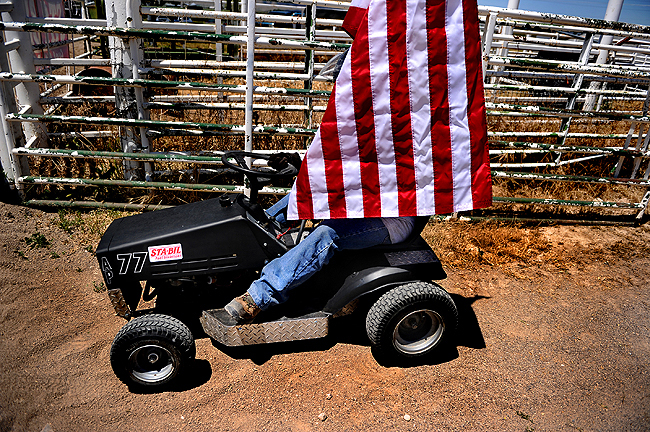 "Gene "Shorty" Joseph Peterson of Springville prepares to circles the track during the national anthem before competitors race lawnmowers at Salem Arena on Saturday. Peterson was racing for the first time this year. "I just retired and have been wanting to do it for years," Peterson said. "It's the most fun I've had without drugs or alcohol."" This past weekend I promised to follow up with a group of lawnmower racers in Springville. I had wanted to do a story on them. A couple months ago, I got to spend less than an hour with the group when I was searching for a feature. I promised to get back in touch when they had another race coming up. But the first time I ended up switching to my demolition derby story because the lawnmower race was far from our coverage area. And this time, well, a herniated disc has me laid up and in Maryland recovering. I hope I can meet up with them before then end of the year or when their season begins in 2011. 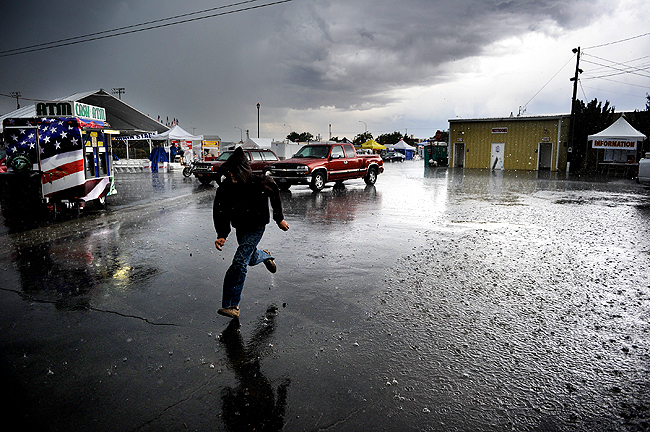 "A young boy runs toward covered tents as heavy rain falls during the first day of the Utah County Fair at the fairgrounds at Spanish Fork, Wednesday, Aug. 18, 2010." My co-worker really liked this photo, so since I haven't shot anything new for more than 20 days being laid up, I figured I'd post it. No separation from the kid's head and the car in the background ruined it for me. I wish I would have framed it better, but when you're shooting through a bulky rain cover in pouring down rain, you take what you can get off before the moment is gone. It was one of the few photos I got of people, other than myself, braving the rain at the fair last month. I thought this picture or this image would run center, but neither did. Another frame ended up running on A1. But I had fun getting soaked for a couple feature pictures. 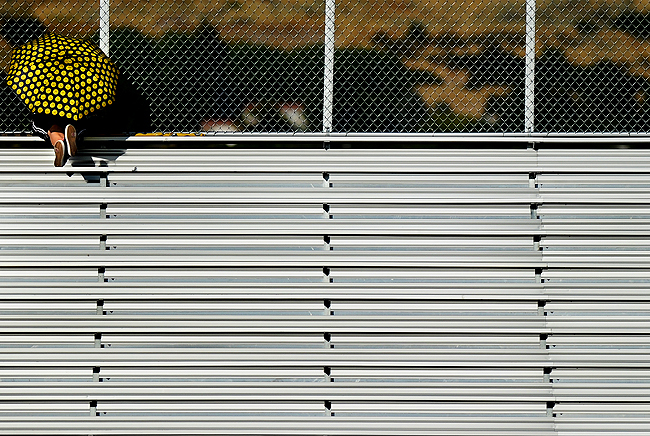 "A fan shades herself against the sun during the Timpview Vs. Pleasant Grove football game at Pleasant Grove High School, Friday, Aug. 20, 2010." It hurts to know that I've almost been out of work for three-weeks since my injury. This football game was the weekend before I herniated a disc in my lower back, and every time I look for a photo to post, I think of this game. Everything seemed to be perfect: the light, the weather, the action, and my shooting. Not to mention, I was running and walking up and down the sidelines with ease. Being laid up is no fun. There is only so many movies, blogs and news one can view and read during the day. I simply want to get out and shoot pictures again. I'll be digging into my outtakes for some posts until I return to work. In the meantime, you can also head over to Utah Photojournalism and see what everyone else in Utah is up to without me. 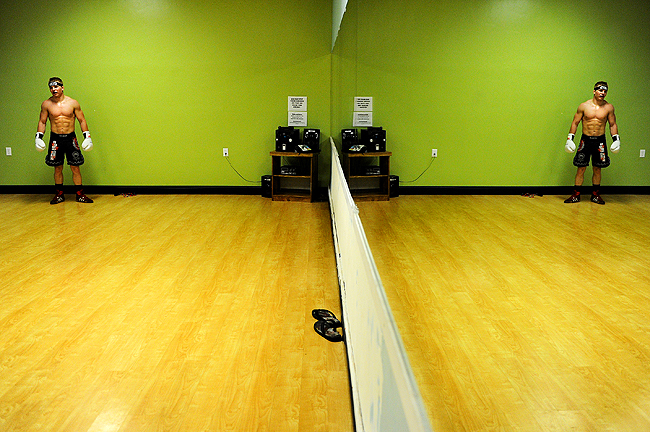 "Jordan Clements of Payson catches his breath as he practices MMA fighting with coach Aaron Garcia (not pictured) of Team Unbreakable at Elite Fitness Center in Payson, Tuesday, Aug. 10, 2010." Everyone nowadays seems to have this obsession with MMA, otherwise known as, mixed martial arts. From those actually involved to photojournalists alike. In the past two years I've seen so many MMA stories. I remember watching POYi the year before last and every other sports picture story was MMA. I don't think any ever placed, but some were really well done stories. I personally liked one my co-worker Mark did last year. Great connection to the fighter's personal, family life. But others I see don't do much for me. They're simply the same story told from a different location. Sure, it's interesting. Who doesn't like two humans sacrificing their bodies and health to beat the snot out of one another? I'd love to shoot an actual event. But I don't think I'd dabble into a story unless there was a unique angle. With that, the above was my first real introduction to the sport. This guy was jacked and would be able to destroy me in a matter of seconds if I was in the cage with him. Not to mention, snapping frames with a 35mm of him as he punched and kicked on his trainer, who basically had on full body suit for protection, was intense. Reminded me that I shouldn't ever pick a fight with him...or anybody for that matter. "Queen of the Miss Utah County pageant, Laurin Burton sits atop the Skiba Auto Repair demolition derby car prior to the opening of the third annual 2010 Utah County Fair demolition derby, Saturday, Aug. 21, 2010." Last month I heard about a demolition derby at the county fair. I knew I had to find someone involved for my Monday Close Up. However, it was almost impossible to get in touch with the organizers. I literally called for days and night, voicemails and e-mails, with no response. I contacted a bunch of other organizers from the fair, who still couldn't find me any local drivers in the Saturday event. So I moved onto another story. Last minute I got a call from a lady who knew of a local team - All Tune Automotive - from Spanish Fork. In my mind I wanted to hang with a driver or team before they even got the car. Show the transformation of a $400 junker into a $5000 soon to be again junker. But since I was out of time, I only got to see the final preparations and document actual event. Unfortunately, by the time my subject crashed and banged with other drivers, the nice light was gone and he was eliminated very, very fast. He got a chance to get to the finals in another heat, yet again was knocked-out of the competition quickly. I wasn't happy with the circumstances, but I still had fun. The above is a mix of images I shot during the night. Most didn't make the story because they weren't of my team. 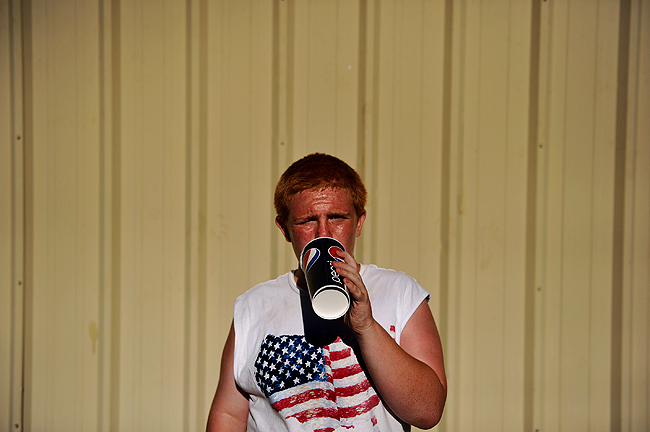 "Burton Perkins of Spanish Fork squints and sweats from the sun as he poses for a picture at the 2010 Utah County Fair at the Spanish Fork fairground, Saturday, Aug. 21, 2010." I wouldn't label myself as a portrait photographer. It's not that I don't like taking them, I simply find posing my subjects for portraits odd most of the time. I find it much easier to hang out with them and capture a candidate moment. Not only is it easier, but my pictures are then natural and more telling of their personality. With that, we as photojournalist are often instructed by our editors to take portraits (deliberately posed pictures if you will) of people for human interest stories. We cannot get around it. And I always tend to over think them, even if they're are suppose to be straightforward. During the fair the other week, as I walked around, Burton Perkins approached me and asked if I'd take his picture. Typically I'd brush someone like him off, telling them I don't pose photos and it's not my job to do so. I get into this "work mode" where I believe everything I shoot will be seen by readers or my editor. While that's never the case, I don't setup situations and I don't want people for an instant think that's what we, as an entire profession, do. Heck, I don't even like when someone unintentionally looks into my lens when I was taking a picture, and then I later see it when going through an edit. And nine times out of ten I don't shoot the pictures people ask for. If they do, most of the time I snap it to make them stop asking or posing. Much in the case with young children who are taught from day one to "say cheese" for every dang photo. So why I decided to take Perkins picture is beyond me. He asked. I was just getting to the fair. I was searching the scenes. Why not. I think it's something I might start playing around with if the time and place is fitting. I told him it wouldn't be in the paper because of the posing situation, he didn't seem to mind, and I ended up liking the frame, so here it is.